Songs of Eretz Poetry Review is pleased to present “Brambles” by Carol Hamilton, Poet of the Month. Ms. Hamilton will also be serving as the guest judge for the Songs of Eretz Poetry Award Contest, which will run from September 1 to October 15, 2015. A detailed biography of Ms. Hamilton may be found here: http://eretzsongs.blogspot.com/2015/08/songs-of-eretz-poetry-review-poet-of.html. The contest guidelines may be previewed here: http://eretzsongs.blogspot.com/p/songs-of-eretz.html. disappeared from sight of the kitchen window. when Michael threw him out of Heaven. We returned scratchy-armed and stain-lipped. and up from the wooded ravine. We left there confused and tainted. long-lawned, rooms perched in the treetops. on our long journey from Eden. Poet’s Notes: This poem began as a piece about my children and how they spent afternoons under the berry bushes outside our Ohio home set at the edge of a forest. Our home there and the woods made a fairy tale setting, but it also was, it seemed, haunted. It was a wonderful setting but not an especially happy time. When I learned about Michael throwing the Devil into the blackberry brambles, imagination got to work. The editor at this journal suggested the poem would be stronger if I wrote it as if I myself were the child telling my story. I usually do as an editor suggests unless the advice does not seem warranted. More often than not, their ideas make for stronger work. Editor’s Note: Do children still have experiences such as those described in the poem? I wonder . . . . When I was a lad, the discovery of a boysenberry bush or even onion grass provided sustenance for hours and hours of unsupervised, semi-arboreal adventures. 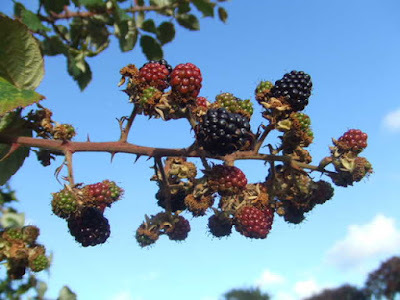 “Brambles” reminds me of those halcyon days that I so enjoyed. These days, it is unthinkable for parents to allow children out of their sight. Play in “the wilds” has been largely replaced by organized, supervised activities far from any “brambles.” Somehow, that makes me sad. “Brambles” was originally published in The Sow’s Ear Poetry Review.